© Alex Wong/Getty Images Real estate investor Tom Barrack has known President Trump since in 1988. 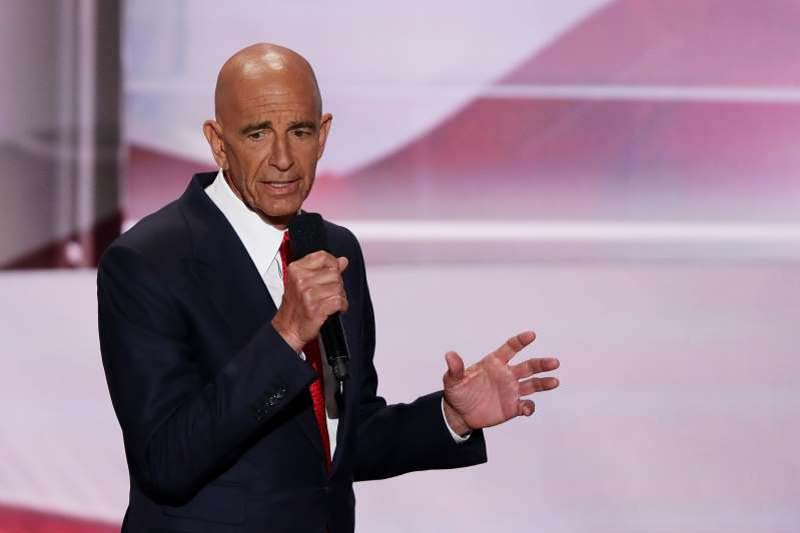 WASHINGTON — Investigators working for special counsel Robert Mueller have interviewed one of President Donald Trump's closest friends and confidants, California real estate investor Tom Barrack, The Associated Press has learned. Barrack was interviewed as part of the federal investigation of possible coordination between the Trump campaign and Russia in the 2016 election, according to three people familiar with the matter who spoke on condition of anonymity to discuss private conversations. The specific topics covered in questions from Mueller's team were not immediately clear. One of the people who spoke to AP said the questioning focused entirely on two officials from Trump's campaign who have been indicted by Mueller: Trump's former campaign chairman Paul Manafort, and Manafort's longtime deputy, Rick Gates. Gates agreed to plead guilty to federal conspiracy and false-statement charges in February and began cooperating with investigators. This person said Barrack was interviewed "months ago" and was asked a few questions about Gates' work on Trump's inaugural committee, which Barrack chaired, and but there were no questions about the money raised by that committee. A second person with knowledge of the Barrack interview said the questioning was broader and did include financial matters about the campaign, the transition and Trump's inauguration in January 2017. Barrack's spokeswoman, Lisa Baker, declined comment. Barrack has rare access and insight into Trump going back decades, since their days developing real estate. Barrack played an integral role in the 2016 campaign as a top fundraiser at a time when many other Republicans were shunning the upstart candidate. Barrack later directed Trump's inauguration. While the specifics of Barrack's questioning were unclear, Mueller's team has asked several other witnesses about the flow of money related to the campaign. Investigators have for months been inquiring about the Trump campaign's finances and compliance with federal election law, according to four people familiar with the matter. Prosecutors' questions have been wide-ranging, these people said, touching on the campaign's data operations, its relationship with data-mining company Cambridge Analytica, payments to Gates and whether there were arrangements that weren't disclosed in filings to the Federal Election Commission, they said. The four people familiar with the investigation spoke on condition of anonymity to discuss details of the confidential interviews. The investigators' questions about the campaign's finances have come up in interviews dating to early fall while prosecutors were preparing the first indictment against Manafort and Gates. Barrack, a wealthy real estate investor with close ties to several Mideast leaders, met Trump in 1988 when he negotiated the sale of The Plaza Hotel in New York to Trump. Barrack's publicist in 2016 described the men as having since "solidified a lifelong friendship between themselves and their families." Barrack employed Gates last year, wrapping up operations on the Presidential Inaugural Committee, before Gates was charged by Mueller. Barrack spoke glowingly of Trump in a CNBC interview in early 2016. "He's one of the kindest, and actually most humble, friends that I've had," Barrack said. "I have so much respect for him because at this point in his career, wandering into the milieu was not easy, and he's changed the dialogue of the debate." Barrack also was among the featured speakers at the Republican convention where Trump formally received the nomination. Days after Trump's victory in November 2016, Barrack told CBS' "This Morning" that Trump was like an ultimate fighter during the campaign who used "whatever tools necessary to convey a really disruptive message." Barrack said America would see "a softer, kinder" Trump now that Trump had won the presidency. Mueller's investigators have interviewed dozens of witnesses in the probe into Russia's meddling in the 2016 election. They have also secured the cooperation of former Trump national security adviser Michael Flynn and former Trump foreign policy adviser George Papadopoulos. But few witnesses have as much insight into the president's lengthy business career and all facets of his campaign and administration as Barrack. Lemire reported from New York and Suderman reported from Richmond, Virginia. Associated Press writers Chad Day, Eric Tucker and Zeke Miller contributed to this report.